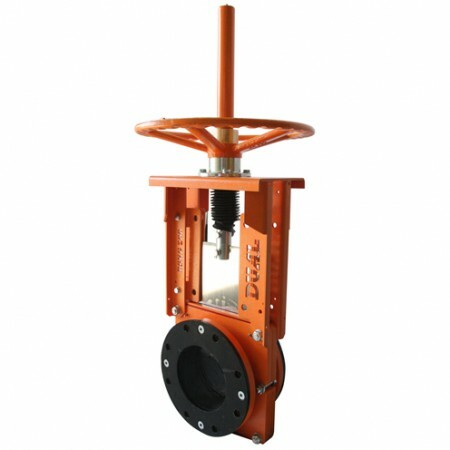 DUAL‘s Slurry Knife Gate Valve is built with a cast SG Iron GR. 42 or fabricated body and features a heavy-duty stainless steel blade. Removable sleeves on either side of the blade provide a bi-directional bubble tight seal, with no metal parts in contact with the slurry. Ease of replacement of sleeves. When open, the knife-gate is fully withdrawn from the slurry flow. Bubble tight shutoff, zero downstream leakage. Light weight for easier handling. No seat cavity where solids can collect and prevent full gate closure. Wide range of elastomers available. 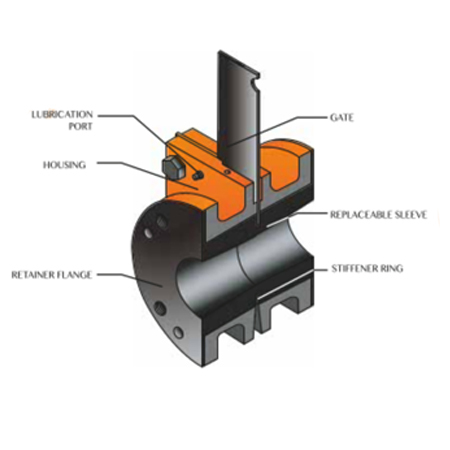 Matching rubber ring sleeves with stiffener ring are placed int the valve housing to seal against each other when the valve is the open position. this tight fit contains the high internal line pressure double seated design provides bi-directional flow and shut off. All types of actuators can be fitted, electric, gearbox, hydraulic, pneumatic and handwheel.